Constraining the contribution of stratosphere-to-troposphere exchange (STE) to the tropospheric ozone budget has been a long standing issue in the atmospheric chemistry community. On a global scale, STE is driven by the propagation of Rossby waves into the stratosphere and mesosphere resulting in slow ascent of air from troposphere to stratosphere in the tropics and downward flow in the extratropics. 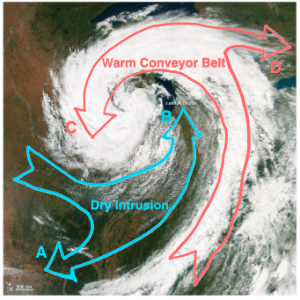 However, observations show that in the extratropics, instead of a continuous downward ﬂow, STE occurs episodically in association with mesoscale and synoptic-scale processes such as extratropical cyclones. Jaeglé, Wood, and Wargan. Multiyear composite view of ozone enhancements and stratosphere-to-troposphere transport in dry intrusions of northern hemisphere extratropical cyclones. Journal of Geophysical Research. PDF. We examine the role of extratropical cyclones in stratosphere‐to‐troposphere exchange with cyclone‐centric composites of ozone (O3) retrievals from the Microwave Limb Sounder (MLS) and the Tropospheric Emission Spectrometer (TES), contrasting them to composites obtained with the Modern‐Era Retrospective‐analysis for Research and Applications (MERRA and MERRA‐2) reanalyses and the GEOS‐Chem chemical transport model. We estimate that extratropical cyclones result in a ﬂux of 119 ± 56 Tg ozone/yr from the stratosphere to the troposphere, accounting for 42 ± 20% of the NH extratropical ozone stratosphere-to-troposphere ﬂux. Jaeglé, L., Wood, R., Wargan, K., 2017. Multiyear Composite View of Ozone Enhancements and Stratosphere-to-Troposphere Transport in Dry Intrusions of Northern Hemisphere Extratropical Cyclones. J. Geophys. Res.-Atmos. 122, 13436–13457. https://doi.org/10.1002/2017JD027656. Highlighted in EOS.